Mark says, "Get the camera ready for a plane in the middle of the road." Whadaya think? Yield to Aerobatic airplanes? After that we had to follow the sign to the airport! 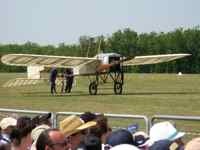 OK, you already know that this Zlin isn't even flying... And you know it's not exactly an antique airplane. So what's this all about? Bottom line is, we're not sure, but we loved the photo op. If you've visited us a few time, by now you've probably figured out that we like almost anything that flies... or should fly, and we just couldn't resist this one! We were on a two week vacation in Romania and Bulgaria. Most of the time we were driving on a road trip to see the history, Dracula's castle at Bran, the Danube Delta and the Black Sea. We were driving through the little town of Tuzla, Romania on our way to find a hotel when Mark says, "Get the camera ready." I have to tell you, there didn't seem to be much that was photo worthy in Tuzla, so I'm going.... Why? 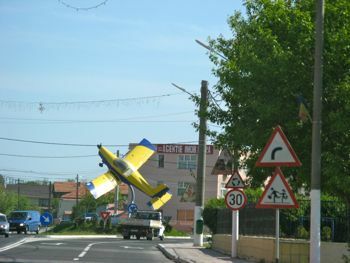 And he says, "There's a Zlin in the road." 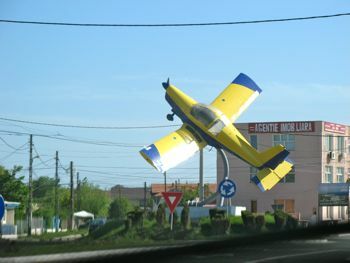 Sure enough, there in the middle of the roundabout was a Zlin on a stick. My moving shot through the windshield wasn't exactly satisfactory, so we went through the roundabout, doubled back, parked the car, and Mark jumped out for the photos. That roundabout sign... makes a great visual, don't you think? Like "Aerobatics spoken here....." or something. 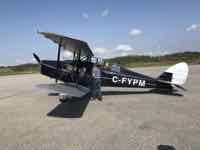 Or the next photo with both the yield sign and the roundabout sign... are we supposed to yield for aerobatic planes? Or are we just supposed to drive around and ignore it like all the local drivers were doing? ....Well you know we couldn't do that. 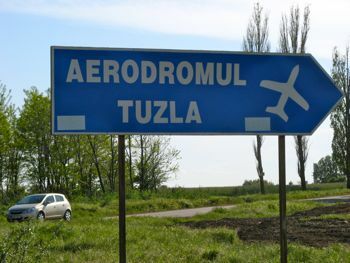 A mile or so further down the road, we saw a sign for the Tuzla Aerodrome... that would be Aerodromul Tuzla in Romanian. We probably would have driven right past, but that Zlin caught our attention so we stopped in. 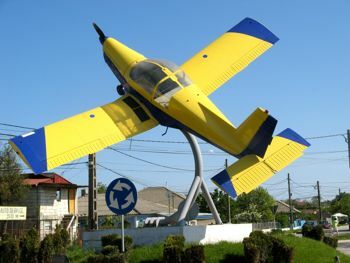 We've seen quite a few gate guardians in our day, but never a Zlin on a stick in the middle of a city roundabout.